As a part of the Museum's 2004 exhibit "Framework of a Community: The Steel Industry in Stark County," staff members conducted interviews with current and former employees of steel companies in the area. These audio files were transferred from reel to reel audio tapes in possession of the MCH School of Nursing Alumni. 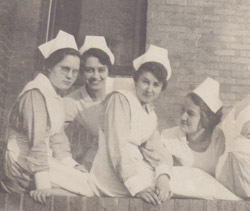 The Massillon Museum will mark the one hundredth anniversary of Massillon’s first nursing school graduating class with the new exhibition, A Century of Service: Massillon Community Hospital School of Nursing. 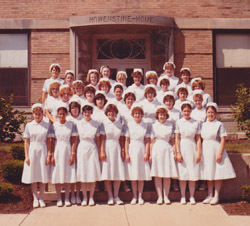 The Massillon Museum has over 300 oral histories in its possession, many having been conducted by staff since the 1970s. Hear stories of living in Massillon from the early 1900s to the present. Many of these oral histories were taken in the 1980s and 1990s, and several others were recorded in 2008 as part of the Massillon Museum exhibit "Greatest Generation." These interviews were then used for accompanying video segments on the 1930s, 1940s, and 1950s. The 1930s video may be seen on Youtube. At this time the collection encompasses approximately 100,000 objects. The largest collections in the Massillon Museum are photographs, household artifacts, costumes, china, glass, pottery and circus memorabilia. Hear descriptions of the highlights of the Massillon Museum's collection. The Immel Circus is one of the most interesting “pieces” in the collection of the Massillon Museum. The 100-square foot miniature circus contains 2,620 pieces: thirty-six elephants, 186 horses, 102 assorted animals, ninety-one wagons, seven tents, and 2,207 people. Listen to different interviews and hear Dr. Immel describe his circus.